I stored my pack at the Kokuu Koyasan Guest House and walked back through town, getting my bearings and having some lunch. Then I walked along part of the series of pilgrims' trails that circle Kōya-san by way of the eight peaks. 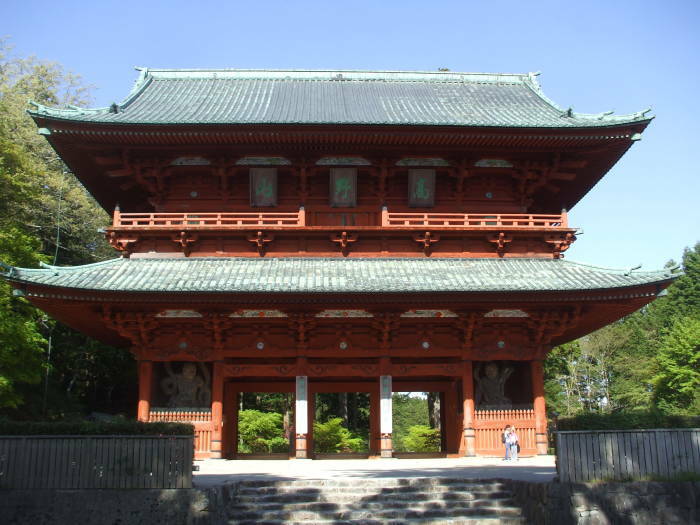 The Daimon is a large gate at the west edge of Kōya-san. Pilgrims since the 900s entered the sacred precincts through this gate. Now it's next to a narrow highway entering the edge of town, so it still functions as a gateway into the complex. The gate was originally built in the eleventh century in Tsuzuraori Valley. It was disassembled and moved here a century later. A gate like this marks the passage into a more sacred space. There are three doors or passageways. Niō guardian figures, also known as Shukongō-shin, stand in alcoves to either side. They are Hindu deities who have been incorporated into Buddhism as protectors against evil spirits. Their fierce appearance keeps demons and thieves out of the temple grounds. Agyō stands to the left as you enter, wielding a vajra or thunderbolt. Ungyō is on the right, empty-handed or wielding a sword. Agyō's mouth is open, pronouncing the sound of the Sanskrit letter अ or A, while Ungyō's is closed, pronouncing the sound of the Sanskrit latter म or MA. Together they pronounce the sacred syllable Aum or ॐ.
Aum is the sacred sound of Hinduism. But it is used as a mantra in Buddhist, Jain, and Sikh practice. More syncretism. Their appearance is derived from the Greek hero Ήρακλῆς, or Herakles. Greco-Buddhist art used traditional imagery of Herakles to represent Vajrapāṇi, the protector of the Buddha. Alexander the Great and his army took Greek culture to the edge of the Indian subcontinent. From there it dispersed even further, through Central Asia and then China along the Silk Road, and then on to Japan along with Buddhism. 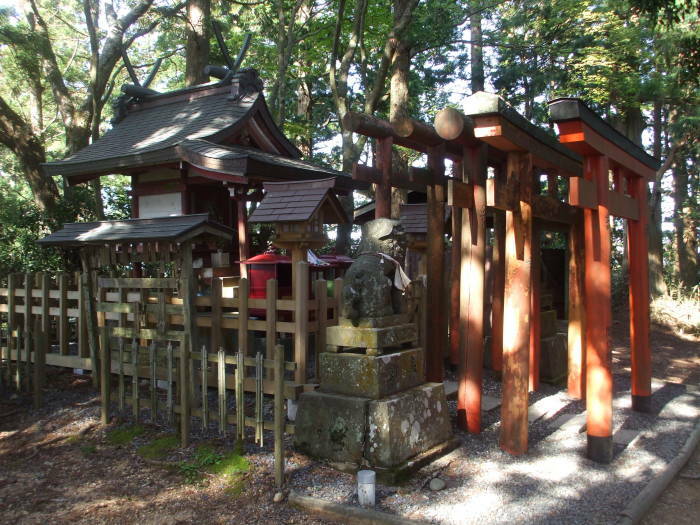 A series of torii or gates leads up from the Daimon. 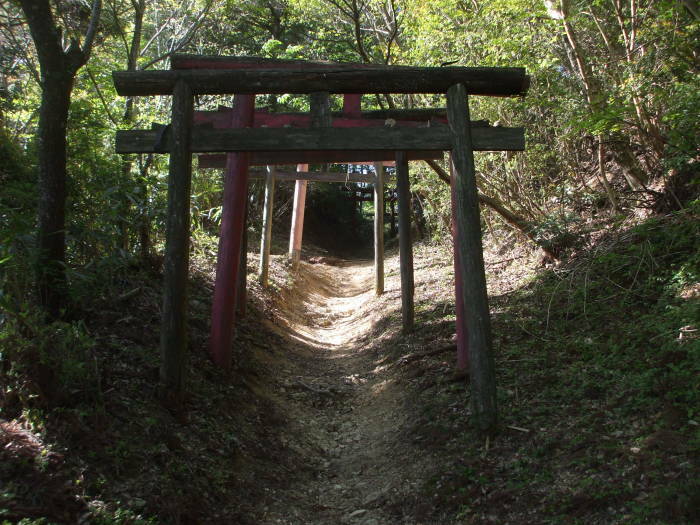 A torii marks a boundary as you pass from common or normal space into sacred space. 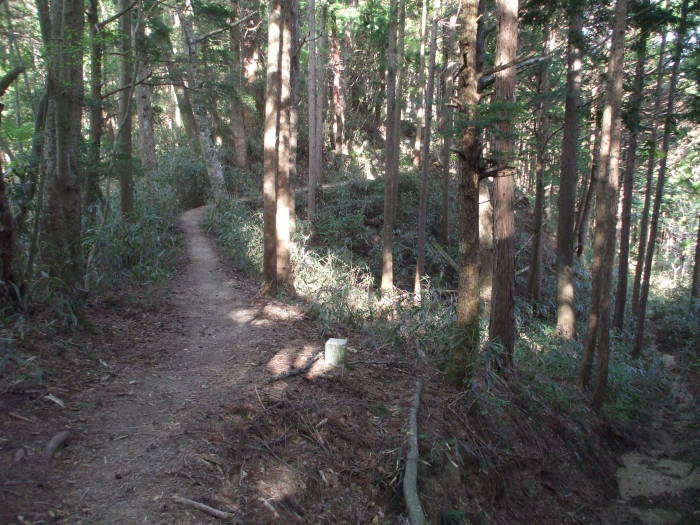 This path is part of Kōyasan chōishi-michi, pilgrimage paths leading to and around Kōya-san. 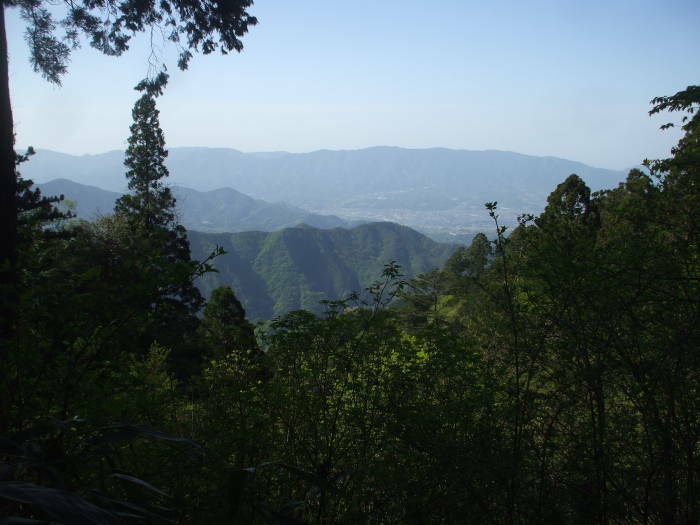 This segment leads north from the Daimon to the peak of Mount Benten-dake, one of the eight peaks of the lotus petal. There are nice views to the west and north as you ascend, and to the north-east from the peak. A Shintō shrine sits at the peak of Mount Benten-dake. The path continues to the east, leading down to the Nyonin-do temple at the northern entrance to Kōya-san. The road from the cable car station to Nyonin-do is especially narrow and twisting, only buses are allowed on the two-kilometer stretch to Nyonin-do. Women were not originally allowed into Kōyo-san. Until 1872 they could only visit temples at the outer gates, like Nyonin-do temple, the only one of those that still remains. Women would follow the path that I just did, from the Daimon up over Benten-dake and down to Nyonin-do. Kūkai was born in 774 on Shikoku island. His uncle taught him to read the Chinese classics. Then Kūkai studied for a while at the Daigakuryō, the government university at Nara, the capital at the time. His studies were preparing him for what probably would have been a bureaucratic position with the government, applying the Confucian material of those studies. He became disillusioned with his course of study, growing more and more interested in Buddhism. When he was about 22, he met a prominent monk who chanted the mantra of the Bodhisattva Ākāśagarbha, known in Japan as Kokuzō Bosatsu. Ākāśagarbha is regarded as one of the eight great Bodhisattvas, referred to as the "Boundless Space Treasury" and the "Void Store". Nōbō akyasha kyarabaya om arikya mari bori sowaka. In the name of Ākāśagarbha Om Flower-Garland Lotus-Crown may it be accomplished. Kūkai had left his government studies and become an independent Buddhist monk. The central government tried to strictly control Buddhism, and independent monks like Kūkai who wandered from temple to temple across the countryside were technically illegal. A mantra is a sacred utterance, a numinous sound believed to provide psychological and spiritual powers. Meditation while chanting a mantra can induce an altered state of consciousness. The mantra worked. Kūkai had a vision in which Ākāśagarbha told him to study the Mahāvairocana Abhisaṃbodhi Sūtra, an important Vajrayana Buddhist text and the earliest comprehensive manual of tantric Buddhism. This was right around the time that the sūtra was first translated from Sanskrit into Chinese. Kūkai tracked down a copy of the sūtra, but it was mostly written in Sanskrit. The fraction of it that had been translated into Chinese was cryptic, and he couldn't find anyone who could explain it to him. Kūkai somehow managed to get himself onto a government mission to China in 804. Of the four ships, one was lost at sea in a storm, another turned back and returned to Japan, and the two remaining were separated. Kūkai's finally arrived in Fujian after a delay of a few weeks, and port officials impounded the vessels and kept all passengers on board. Thanks to his uncle, Kūkai was fluent in Chinese, and his letter to the provincial governor finally got them released. They were directed to continue to Chang'an, present-day Xi'an, the capital of the Tang dynasty. Sanskrit was Kūkai's first line of study in China. Then, in 805 at the Qinglong Monastery in Chang'an, he met the Master Huiguo. This was the teacher who would instruct and initiate him into the Vajrayana tradition, an esoteric Buddhist doctrine only recently brought from India to China. It would usually take something like 20 years to fully instruct someone in the doctrine, but Kūkai memorized the material rapidly. Master Huiguo pronounced Kūkai a master in just a few months, describing the process as "like pouring water from one vessel into another." Master Huiguo died soon afterward. He had foreseen his death and the end of Esoteric Buddhism in India and China. Sure enough, 30 years later Emperor Wuzong of Tang ascended to the throne of China. Wuzong viewed Daoism as the ethnic religion of the Han Chinese. He considered Buddhism, with its origins in India, to be an alien religion, with its monasteries and temples nothing more than useless tax evaders. In 845 he destroyed 40,000 Buddhist temples and 4,500 monasteries, forcing about a quarter of a million Buddhist monks and nuns out of the monasteries. Wuzong was soon assassinated, but Chinese Buddhism and especially its Esoteric practices never recovered. Kūkai returned to Japan in 806 as the 8th Patriarch of Esoteric Buddhism. He brought a collection of texts that were new to Japan. Kūkai is called Kōbō-daishi or the Great Master of the Propagation of Dharma, or Odaishi-sama, the Great Master. Kūkai established the Kōyasan Shingon or True Word sect of Japanese Buddhism. Shingon is the Japanese pronunciation of the Chinese Zhēnyán, or "True Words", which in turn is the Chinese translation of the Sanskrit word mantra. Shingon is now one of the major schools of Buddhism in Japan, and it is one of the few surviving Vajrayana Buddhist lineages surviving in East Asia. 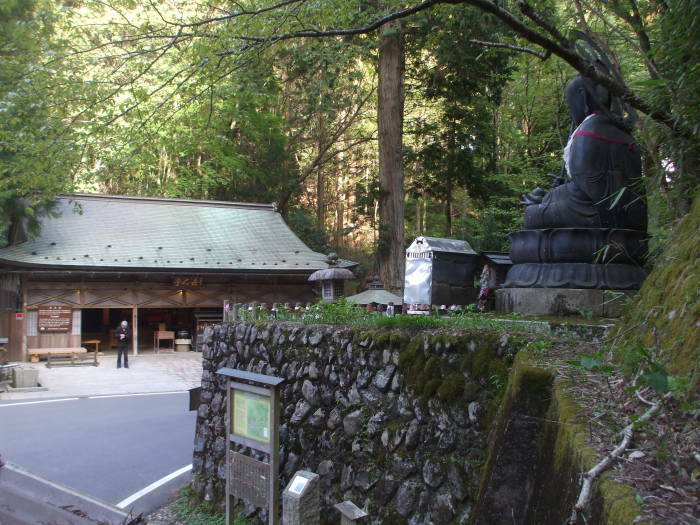 There are over 4,000 Shingon temples throughout Japan. Shingon was controversial at first, as it held that someone could achieve enlightenment in one lifetime through the proper performance of philosophical training and rituals. The rituals involve body (gestures or signs), voice (mantra), and mind (philosophical ideas). Shingon says that enlightenment is not a distant concept requiring an enormous number of reincarnations over aeons of time. It's sort of the Buddhist version of the debate over salvation by faith versus salvation by works (in the form of reincarnation). The rituals involve various implements, incense, sounding instruments such as bells and cymbals, figures and images, and combinations of Sanskrits letters to be pronounced — symbols appealing to various senses. The Japanese Emperor Saga supported Kūkai's request to establish a new monastery in 816. Kūkai selected the Kōya-san location because of the supposed lotus blossom shape of the high valley and its eight surrounding peaks. Under the leadership of Kūkai, and after his death, his disciple Shinzen, there soon were over 1,500 monasteries and several thousand monks in the mountaintop valley. Kūkai is credited with many non-religious accomplishments. Tradition says that he devised the kana, the Katakana and Hiragana scripts based on Chinese (with Sanskrit influences) in which Japanese can be written phonetically. He is also credited with civil engineering projects such as the Manno Reservoir, which still is the largest irrigation reservoir in Japan. Kūkai had studied a secret doctrine in his youth, before traveling to China, and the doctrine of the esoteric sect has remained secret, or at least largely undocumented. Kūkai finished his largest work, the Jūjūshinron or the Treatise On The Ten Stages Of The Development Of Mind in 830. Because of its length, it has never been translated in its entirety into any other language. Only some of his major works have been translated into English. The Shingon doctrine remains esoteric, with its doctrines not written but passed down in oral form. There is very little in printed form in Japan, and far less outside Japan. The teachings are conducted entirely in Japanese, further limiting understanding. The Japanese kana scripts aren't that hard to learn!